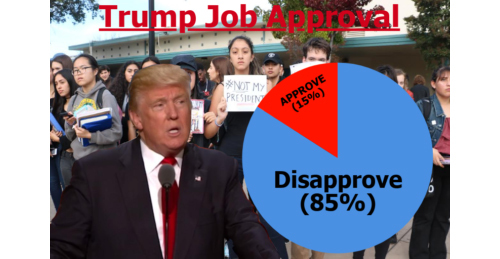 Few Bay Area young people have given their hearts and minds to President Donald Trump; a student poll at my once-conservative school measured 85 percent disapproval. But when it comes to getting teens informed and involved in politics, “your favorite president” has indisputably achieved “yuge” success. That became clear the day after his 2016 election when hundreds of outraged students walked out of classes at Castro Valley High School. Numerous other protests and actions since then also showed increased political engagement. So did the final project from the government class that I teach. I asked students to write to elected officials about topics of their choice. They penned letters to Trump, Senators Dianne Feinstein and Kamala Harris, Congressman Eric Swalwell, Governor Jerry Brown and others. Even letters addressed to those besides the president frequently concerned his administration. The writers’ positions trended to the left. This will please some and anger others but should surprise none considering the liberal trends of both our region and state which Trump has visibly magnified. But perhaps people of all political persuasions can take heart that young people in general are becoming more connected to the political system that governs so much of American life. Examples include the Parkland shooting survivors demanding steps to reduce gun violence, six teenagers running for governor of Kansas, and more than 100,000 California youths pre-registering to vote as soon as they got the chance. My students’ letters show me that their authors are more educated and insightful about the news than their older siblings just a few years ago, and certainly more than I was at their age. As this year’s graduates pursue their futures and eventually take the their turn leading the country, I know they will continue to face great challenges. Not least of these will be partisanship which divides us out of spite even when we agree in principle. But I’m encouraged to see apathy declining. Perhaps that’s one accomplishment by the “very stable genius” in the White House that even his foes can appreciate.